The SEALCORE Network is the result of the union of some entrepreneurial Italian Companies active for many years in the production of customized articles to drawing and technical components for various industrial sectors. The Companies of the SEALCORE Network are active in these World Wide industries: Aerospace - Wind - Mining and earth moving machines - Primary Metals – Pulp & Paper - Naval & Marine - Aerospace - Food - Automotive - Automation - Chemical and Petrochemicals - Pharmaceutical - Hydraulic, Heating & Sanitary Systems - Dynamic Sealing - Heavy Duty and General Industry. The SEALCORE Network is made of 12 Companies for a total of 652 employees and 130 million € in sales in the year 2017. Approximately 44 million € have been invested between 2015 and 2017 in technology, infrastructure, qualified staff, updates 4.0, machines and equipment, and further 21 million € are planned for investments in 2018. The lean management and a focus on the service to the customer, in addition to the quality made in Italy guaranteed, are the strength of the SEALCORE Network and its 7 main divisions. Large diameters and endless O-Rings produced with an innovative step-molding method. The history of OringOne S.r.l. starts in 2002 thanks to the contribution of Duci S.r.l. and the F.lli Paris S.r.l., as a start-up production wanted to find a production method for series O-Rings with dimensions over the standards. The market was requesting a solution to replace those large size O-Rings produced with traditional methods (hot-joint vulcanized or using glues), that were no more performing in hi-end applications. After 5 years of R&D; after having conceived, designed and built completely new and up to now non-existent machines and procedures, OringOne S.r.l. was finally in the position to provide the right answer to this important demand from the market. By the end of 2010 OringOne S.r.l. was officially created, introducing in the international market state-of-the-art products and service thanks to an own independent management and sales activity. Today OringOne S.r.l. is a landmark for the power supply industry; in the naval and the maritime industry; for the heavy duty machines, and in general in the global business where this top-end O-Rings are needed to guarantee an excellent sealing performance. O-Rings in various compounds with many approvals and certificates of quality, for a wide range of industrial sectors. Duci S.r.l. was founded in 1983, and since then it is being producing O-Rings. Duci S.r.l. 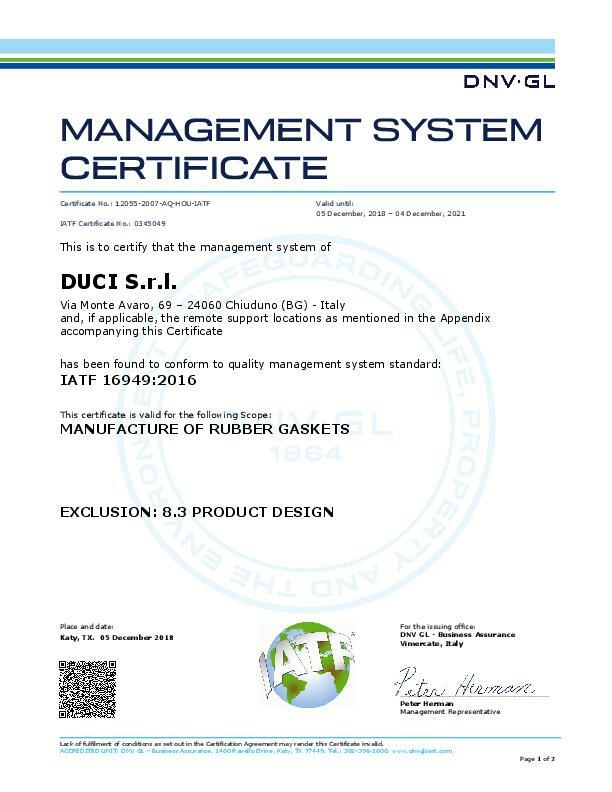 produces, tests and certifies billions of pieces every year, and can proudly assert to be today one of the most important Companies in Europe specialized in the production of O-Rings and technical rubber articles. The Company has grown thanks to the competence, the tenacity and the resourcefulness of its employees. An excellence service, and an optimal ratio between price and quality has allowed Duci S.r.l. a continuous growth, contributing to the creation of an advanced Company with 2 production locations: in Chiuduno (BG) and in Bolotona (NU). 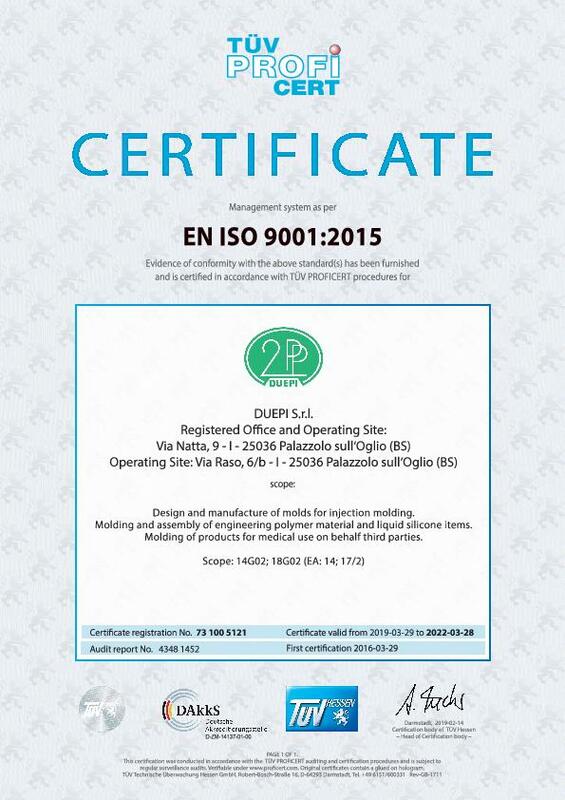 Thanks to the certification ISO 9001 and ISO/TS 16949; thanks to the high-level of the automated production lines, and to the most modern optical machines for the 0-defect control and packing of the items, Duci S.r.l. can always guarantee top level supplies to its customers. Molds design and manufacturing. Injection molding of custom made articles, in technopolymers and liquid silicon. Duepi S.r.l. is specialized in the production of custom made items produced with various technopolymers and liquid silicon. Thanks to our competence in the designing and the manufacturing of molds and tools made on customer's needs, we are able to offer finished single ready-made articles or assembled sets. Duepi S.r.l. has a long experience with the most modern technologies and machine tools in the Rubber and Plastic industry. The know-how of the engineers, the computerized and robotized molding technologies, as much as the versatility of the technopolymers allow us to create a wide range of products for the most various applications: from custom made elements for the early childhood, to the electric and electronic industry going through the pharmaceutical and the hydraulic industrial sectors, satisfying the largest demand for the most various technical needs. In 2016 thanks to the great competence of its team Duepi S.r.l. was able to extend its range or products to new types of materials such as luminous techno-polymers, and special elastomers like liquid silicon. The design and creation of articles to drawing starting from the study of the mold, make Duepi S.r.l. a valid partner also for those Companies, that want to produce the final products in house and are looking for a good supplier and advisor for the tools. PTFE, PEEK and HPP – High Performance Polymers. Stock shapes and customized engineered components. Since its foundation in 1966, Fluorten S.r.l. has always identified itself with the brand that distinguishes high Quality products. Over the years, the Company has been able to develop solidly, with a growth compatible to its own technical and economic capacities.The activity started with Fluoropolymers has been grad­ually expanded with the processing of technical parts in Techno-polymers, closely developed with the customer. Fluorten S.r.l. corporate “philosophy” to work with each customer to solve project design, and production prob­lems to obtain competitive products has continuously driven the Company to invest in people and technolo­gies. Currently the Fluorten S.r.l. production is composed by very modern project designing tools, extrusion and moulding process, and mechanical machining able to supply semi-finished or finished products in PTFE, PEEK and injection moulded Techno-polymers with the highest Quality level. The Fluorten S.r.l. technicians guarantee an internal process with monitoring and reliability stand­ards, that are difficult to find elsewhere. Rotary Shaft Oil Seals and custom made articles in Elastomer and Rubber-to-Metal. The Company F.lli Paris S.r.i. starts in 1979 as a pro­duction Company for custom made technical articles in rubber. Competitiveness, vision and foresight have allowed the Company to diversify production over the years, getting the opportunity nowadays to meet in a diffused and effective way the requirements for the worldwide market for high-end rotary shaft seals. In 1995 the moving to the new production site, and the focused investments made to create an internal production of all the manufacturing lines – from the design and creation of the molds, to the production of the finished items – and the further acquisition of the Company ATS Special Oil Seals S.r.l. in 2012 made this independent familiar Company to become a reference in the worldwide industry for rotary shaft seals, and industrial components made in rubber-to-metal. Special large size Rotary Shaft Oil Seals for applications in the heavy duty industry. ATS Special Oil Seals S.r.l. was founded in 1983 in Nova Milanese (MB) as a Company specialized in the production of special and large size oil seals for the heavy duty industry. The agreement in the ’90s with the Company F.lli Paris S.r.l a socio unico allowed ATS S.r.l. to extend immediately its presence in the international market. The definitive merging with F.lli Paris S.r.l. 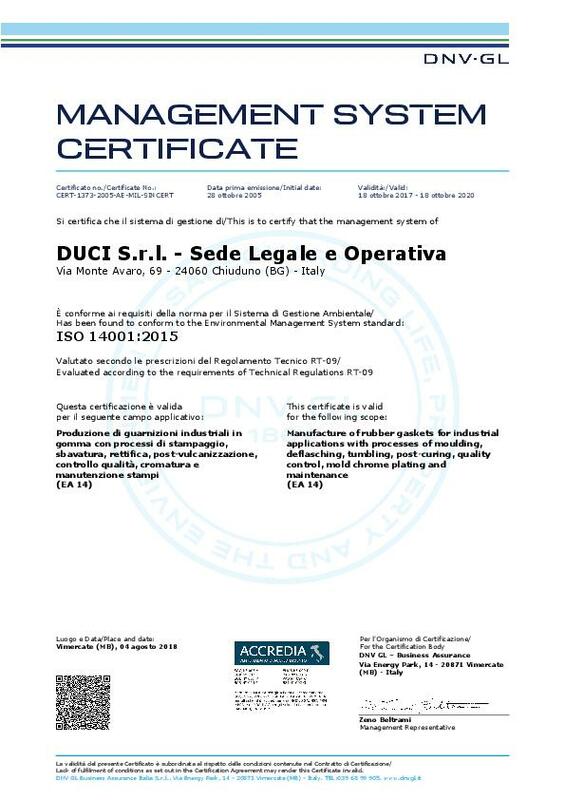 a socio unico in 2012 has secured the recognition to the ATS brand making the Company one of the worldwide production leaders for large size special oil seals for: paper mills, steel mills, wind mills, crushers, naval and marine industry, large gearboxes, and the general heavy duty industry. Self-lubricating bushings and washers for valves and other applications for the Hydraulic, Energy and Primary metals industry. Slib Italy starts its operation at the end of 2011, as a new production division of F.lli Paris S.r.l. specialized in the ma­nufacturing of pressed Sliding Bearings with thin wall-thi­ckness, dry self-lubricating, or with grease or oil lubrica­tion, and produced in accordance to the ISO 3547 directive. The Sliding Bearings are supplied in cylindrical shape, as thrust washers or as strips, or be customized upon a specific request or drawing from the customer. The dimensions range from a min. of 10 mm to a max. of 1.000 mm, both for standard sizes and for special ones. The application field for the Slib Italy products covers a wide range of industrial requests, but in particular the valve production market, and applications in the hy­draulic, primary metals and power generation industry.